LOCATION.--Lat 41`49'07", long 78`17'35", McKean County, Hydrologic Unit 05010001, on right bank 40 ft upstream from bridge on U.S. Highway 6 at Port Allegany, 1.1 mi upstream from Twomile Creek, 1.4 mi downstream from Allegheny Portage Creek, and at mile 285.5. PERIOD OF RECORD.--October 1974 to current year. Discharge measurements obtained by U.S. Army Corps of Engineers March 1971 to October 1974. 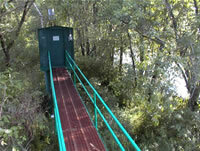 GAGE.--Water-stage recorder, water-quality monitor and heated tipping bucket precipitation gage. Datum of gage is 1,454.88 ft above National Geodetic Vertical Datum of 1929. Satellite telemetry at station. COOPERATION.--Funding for the operation of this station is provided by the U.S. Army Corps of Engineers, Pittsburgh District, the New York Department of Environmental Conservation, and the U.S. Geological Survey.